The hand starting at 41:45 in the Jack Wilcox 4 strategy video is a perfect example of Zeebo's theorem. 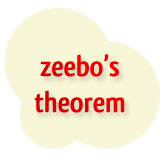 Is Zeebo's theorem still effective? Yes, and it's the most reliable theorem out of all the ones listed on this site. The theorem was put forward back in 2006, and has helped to make followers of this theorem a nice amount of money ever since. A full-house is a very strong hand. Full houses do not come around regularly. Therefore players will very, very rarely fold a full house. If you think about every possible situation of where you hold a full house in Texas Hold'em, you will not be able to find one where you can comfortably fold the hand. Even if the bet is very large, the chances are that you and other players will call the bet when you hold a full house. In addition, even if your opponent holds a very weak full house, the fact that there is always the possibility that you could be bluffing means that they are going to force themselves to call anyway. They may not like making the call, but they are going to put that money in the middle when they have a full house. You may not have thought about this idea too much before, but I'm sure that you can understand that this particular theorem holds a lot of truth at the Texas Hold'em tables. How to use Zeebo's theorem to your advantage. Now that you are aware of Zeebo's theorem, you need to do two things to start making money from the use of this particular theorem. Do not try and bluff anyone that you suspect holds a full house. Get as much money into the pot if you think your opponent has a full house and you hold a better hand. Pretty straightforward right? If your opponent is never going to let go of their full house regardless of how much money you put in the pot, you should get all your money in the middle when you have the best of it and never bluff if you are behind. If you can remember these two simple rules the next time you are confident that your opponent has a full house, you will be able to save and win yourself a nice sum of money. Just a simple example for this one. But it should highlight how useful the theorem is pretty well. Opponent's Hand: Let's say that we have good reason to suspect that they have a Q. On this board, you should be looking to get as much money into the pot as possible. There should be no slowplaying here if you think that your opponent has a Q, because they will have a full house also and there is no getting away from the hand for them. Even though they have the worst full house, they will almost always convince themselves to call in case you might be bluffing. As much as they dislike it, they are going to call. If you put yourself in your opponent's position, I'm sure that you can empathize and understand how you can exploit Zeebo's theorem fully. Zeebo's theorem example hand history. Although Zeebo's theorem is good 99% of the time, there's always that 1% of the time where a tight player folds a full house. Here's a prime example of that 1% in a HSP hand between Johnny Chan and Phil Laak. I think Phil Laak's fold here is warranted. Chan is a very tight player and it's very unlikely that he's raising with anything that's beaten by 77. Of course, that's easy for me to say as I know each player's holecards. The suspiciously impressive part though is Laak's insta-fold – even the very best players would want to take a moment to think about it. Nonetheless, these instances are rare, and even when a situation like this pops up the majority of players will call anyway. Even though Laak's fold looks like the right play, calling is far from horrific, and that's what most players will think as well (if they're good enough to think on that kind of level). Zeebo, "captZEEbo" or to use his full online alias "Captain Zeebo" is was a professional high stakes online poker player. Captain Zeebo's real name is Greg Lavery. And here’s a really interesting documentary on Captain Zeebo's life as a professional poker player by Deuces Cracked. If you want to find out even more about captZEEbo, you can also check captZEEbo's 2+2 member profile and search through all of his old posts and threads. If there is one poker theorem that you should learn and use at the tables, it should definitely be Zeebo's theorem. It is pretty straightforward, and it will help to win more money. Simple as that. There is not much else I can really add to that, except for that you should try and make a conscious decision to think about when your opponent may have a full house. Otherwise the opportunity to take advantage of Zeebo's theorem will just pass you by. Don't let this be an article that you read and forget 10 minutes later. Hit the tables and think about the theorem – it will get drilled into you this way.